In spite of a momentous directorial debut and performance from Bradley Cooper, Lady Gaga leaves the lasting impression in A Star Is Born, a beautiful production perfectly suited to re-release the superstar as a top-tier performer; she is nothing short of astounding. When Jackson Maine, the fading rock star played by Bradley Cooper, says “it’s the same story, told over and over,” he’s referring to music and the 12 notes on the octave that can be scrambled and reinvented endlessly. Cooper could very well be speaking for A Star Is Born itself, which, now in its fourth go-around, humbly and poetically reminds us that stories can not only be retold well, but that they can reinvent themselves, too. The basic story goes that a talent is risen. It’s a fitting foundation for a film that hosts similar discoveries in its production. Actor-turned-filmmaker Bradley Cooper is a scruffy, raspy-voiced singer in front of the camera, as well as a seemingly veteran storyteller behind it. The opening concert sequences are electric, exciting, and deafening – an expert method of joining us with Cooper’s character, who’s suffering from tinnitus. And though the vocal majesty of Lady Gaga is not lost upon many, there’s an early scene at a drag club that almost reintroduces her ability, while also announcing a new one in acting. Maine stumbles into the unfamiliar bar in a familiar quest for liquor, but as Ally (Gaga) takes the stage for her version of “La Vie en Rose,” he’s blown away, as are we. It looks like the first time in a long time where alcohol wasn’t on his mind. In these moments, an actress is born, as is a director, though the passion which the duo brings to the project suggest much more experience. The two fall in love with each other’s talents, and soon – the next day to be exact – Jackson has Ally flown out to one of his gigs, where a backstage pass and an arrangement of one of her songs await. 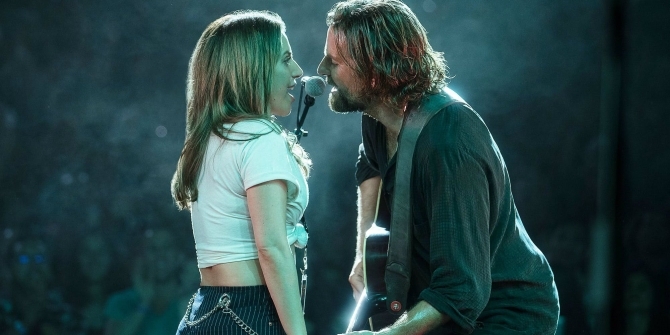 Together they sing “Shallow” in hair-raising harmony (a song which will assure the movie and songwriter Gaga at least one Oscar win) and, in one of the film’s more obvious nods to the times, they become a YouTube sensation. From there, their romantic and professional lives skyrocket. To the film’s benefit, Gaga and Cooper were essential in creating much of the soundtrack. It’s one of the many details of this production that add intimacy and validity to the story, which has now been told four times. Not much has changed between renditions, and yet, A Star Is Born breathes fresh life. Of course, the greatest contributor to that is the immediate connection between the actors/singers, which their characters also share. That bond is developed in the film’s first act, its best, and it struggles to carry that energy throughout the entirety of the retold tale. Slight steam is lost as it turns the corner of familiarity, with Ally venturing into her own career as a mega pop star, and Jackson collapsing in his. Pop music is not always bad, and the triangle which forms between Ally, Jackson, and Ally’s manager is the least effective part of the film. By participating in this role, I’m not sure what Gaga is trying to say, but if it’s that she wants to separate herself from the meat dresses and the facades she’s been attached to for years, perhaps it would have worked better if she hadn’t used her stage name in the billing. In fact, I was surprised that she didn’t. Thankfully, Cooper manages to regroup in the end, concluding his debut picture with a series of events that viewers who have not seen any of the originals will probably be able to predict, and yet still be moved by. It didn’t even dawn on me that A Star Is Born was a musical until I saw the unbelievable list of song titles in the credits. But it’s not about music, it’s about people. Cooper has proven he knows how to direct a cast, getting great work from Gaga, and a long string of supporting roles, including Sam Elliott as Jackson’s brother. But the work will be remembered for Ally and Jackson, not Bradley and Stefani, Gaga’s real name.